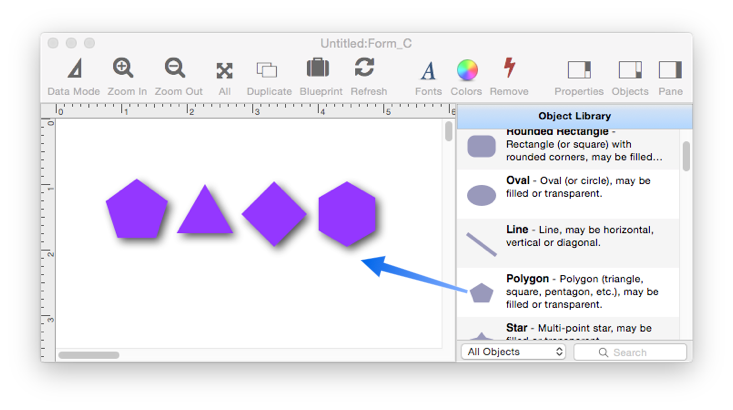 Use this type of object to create a multi-sided polygon (triangle, pentagon, hexagon, etc.). Use the magic panel to control the number of corners the polygon has. You can also set the angle of the top corner of the polygon. To learn about modifying the color, fill, stroke (border), opacity and drop shadow, see Form Object Appearance. Adjusting Object Spacing -- adjust the spacing between multiple selected objects so that the same amount of space is in between each pair of objects. adjustobjectspacing -- adjusts the spacing of selected objects in a form. adjustobjectspacingdialog -- opens a dialog sheet to adjust the spacing of the currently selected objects. Aligning Objects -- so that two or more object edges are made even with each other. Automatic Form Construction -- creates a column of form elements for editing data fields (or variables). Automatic Mailing Label Construction -- creates a mailing label. Automatic Report Construction -- creates a tabular report with columns of data. Creating a New Form Object -- with the Object Library. Data Button Object -- is used to create checkboxes and radio buttons. Displaying Data in a Grid -- fundamentals of displaying data in a grid (Text List/Matrix). Duplicating Objects -- to make copies of one or more objects. Fixed Image Object -- is used for fixed images (images that never change). Fonts -- setting the font and text size of form text objects. Form Object Appearance -- changing the color, fill, stroke, opacity and drop shadow attributes of selected objects. Grouping Objects -- allows you to manipulate multiple objects as if they were a single object. Image Display Animations -- animated images. Image Display Data Buttons -- checkboxes and radio buttons created from custom images. Image Display Object -- is used for dynamic images (images that change depending on the data). Image Display Push Buttons -- push buttons created from custom images. info("clickedobjectname") -- returns the name of the button that was just clicked. Line Object -- draws a line within a form. Matrix Clicking -- handling clicks in a Matrix Object. Matrix Constructor -- quickly creating a Matrix Object from a template. Matrix Database Integration -- synchronizing a Matrix Object with a database. Matrix Geometry -- customizing the size and geometry of Matrix Object elements. Matrix Header and Horizontal Scrolling -- setting up a custom header for a Matrix Object grid. Matrix Object -- displaying a grid of items with a custom arrangement. Matrix Object Frame -- setting up the arrangement of items within a Matrix Object. Object Inspector Panel -- is used to view and modify the attributes of selected objects in a form. Object Library -- is used to create new objects in a form. Object Names -- can be used to identify an object in a program. Oval Object -- draws an oval or circle within a form. Popup Menu Button Object -- is used to create popup menus anywhere on a form. Push Button Object -- triggers a procedure when it is pushed. Rectangle Object -- draws a rectangle or square within a form. Report Tile Object -- component for assembling a custom report. Rounded Rectangle Object -- draws a rectangle with round corners within a form. Scroll Bar Object -- is used to create scroll bars. Segmented Button Object -- is used to created segmented buttons. Selecting Form Objects -- so that they can be modified. Slider Object -- is used to create sliders and knobs. Smart Resize -- adjusts the sizes and locations of the other selected objects to match the change of one object. Star Object -- draws a star within a form. Stepper Object -- is used to create numeric steppers for use with Text Editor objects. Tab Panel Appearance -- appearance options for a Tab Panel Object. Tab Panel Buttons and Selection -- button options for a Tab Panel Object. Tab Panel Constructor -- quickly creating a Tab Panel Object from a template. Tab Panel Content -- setting up the content for a Tab Panel Object. Tab Panel Forms -- setting up the forms for a Tab Panel Object. Tab Panel Object -- switchable tab panels. Text Display Object -- is used to display text using a formula. Text Editor Object -- is used to edit text in a field or variable. Text Label Object -- displays a short, fixed, text item within a form. Text List Appearance -- customizing the appearance of a Text List Object. Text List Constructor -- quickly creating a Text List Object from a template. Text List Database Integration -- synchronizing a Text List Object with a database. Text List Object -- displaying a grid of text. Text List Programming -- programming a Text List Object. Text List Searching -- searching within a Text List Object. Text List Selection -- selecting items in a Text List Object. Web Browser Object -- is used to display web pages from within a Panorama form. 10.0 New New in this version.